Nautical nods ground a weekend retreat in its surroundings on the shores of Table Rock Lake. The house that Dake-Wells Architecture designed for Cory and Kerry Watts in the Ozarks in southwestern Missouri is defined by subtle nods to its lakeside setting, such as an elevated wooden plank that carries visitors over a bed of river rock to the north entrance. The knotty-grade tongue-and-groove cedar siding was an aesthetic touch as well as a cost-saving one, architect Mark Wheeler says. "Higher grades wtihout knots doubled the price," he says. In the end he and his team decided that the knots "fit the existing context more accurately." The skylight boxes are clad in lap-seam metal panels, which Wheeler describes as an economical material choice. The floors are prefinished tongue-and-groove oak, a common species in the area. The cherry casework is Kaffe by KraftMaid. The living room and a deck offer expansive views of Table Rock Lake. 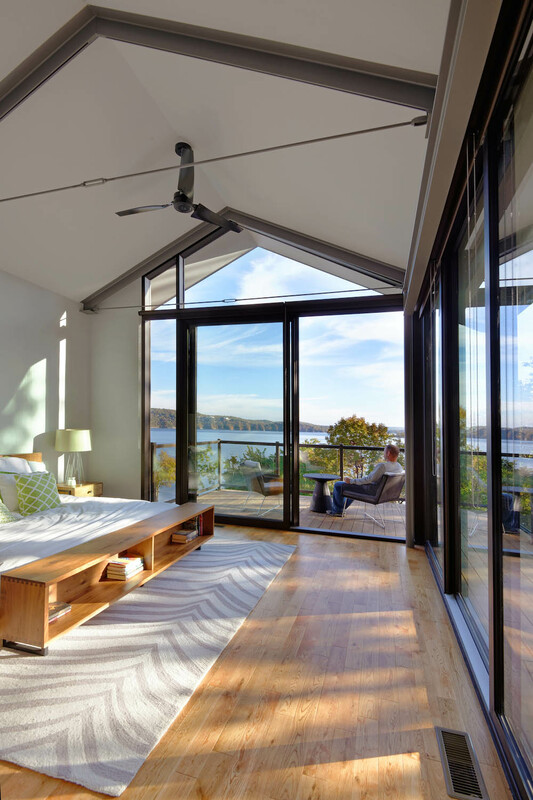 Sliding glass doors in the master bedroom open onto a deck overlooking the lake. The cedar deck was finished with Sikkens deck stain. The stair treads are solid-oak planks, stained and finished to match the oak flooring. Dake-Wells carfully sited the house to fit on a wedge-shaped lot, preserving privacy by editing views of houses that sit close by on either side. In 2009, Cory and Kerry Watts approached Dake-Wells Architecture to redesign the offices of their company, KLF Architectural Systems, a Springfield, Missouri-based supplier of aluminum curtain-wall systems. The project earned the firm an AIA merit award, and it proved to be a rewarding experience. So the firm signed on eagerly when the Wattses asked if Dake-Wells would design a summer home for them and their three young children on a narrow, wedge-shaped lot on a steeply sloped peninsula overlooking Table Rock Lake in Kimberling City, Missouri, 44 miles south of Springfield. The trick was siting the house on a narrow lot in a 1960s-era subdivision. 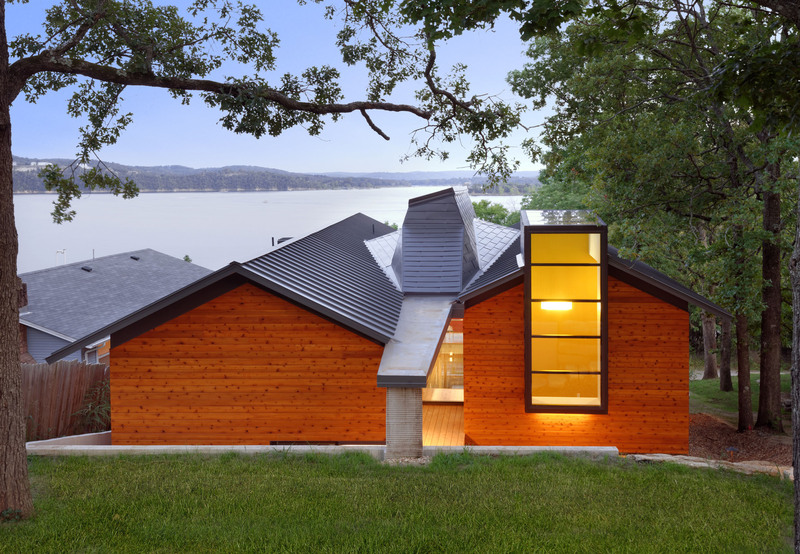 With neighboring houses just feet away on either side, and the lake shore to the south, the architects carefully oriented the house to block unwanted views while framing spectacular ones. The house is organized into two “bars” set at a shallow angle—one housing public spaces, the other private ones, with an open staircase in the wedge-shaped center. A skylight over the stairs lets in generous amounts of natural light while the expansive views of the lake are gradually revealed—most notably through floor-to-ceiling windows in the kitchen, on the second floor. The 3,600-square-foot house was completed in August 2013. Subtle nods to the home’s lakeside surroundings can be found throughout. Accessing the house via the entrance on the north side involves stepping from a bed of river rock onto an elevated wooden plank, an experience not unlike stepping from the lakeshore onto a floating dock. The roof was inspired by the thin gabled metal roofs on the docks along the lake’s perimeter. The stair railing and angled steel trusses visible inside reference the girder of the nearby Kimberling City Bridge.